Reeder for iPhone has quickly become the number one news reader app for the iPhone. Recently the developer brought the application to Mac OS X. Reeder for Mac brings all of your Google Reader RSS feeds into the application for an easy reading interface and management tool. You do have to have a free Google Reader account to be able to add RSS feeds but by now users probably have a Google account if they’re online. Synching through Google Reader allows for users to keep their reading lists synched. Reeder has a very customizable interface and has gestures built in by using the trackpad. Users are able to customize button layouts to streamline your RSS reading process. Reeder also integrates with Instapaper, ReadItLater, Readability, Pinboard, Delicious, Zootool, Evernote, Twitter, Mail, Instapaper, Mobilizer, Safari Reading List and Google Mobilizer. 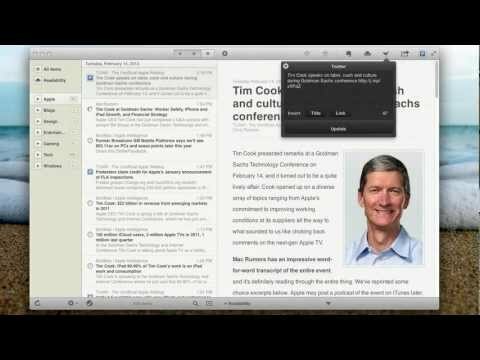 Reeder is a full feature application that has a one or multicolumn layout for easy reading and to keep on the desktop all the time. Check it out today in the Mac App Store for $9.99, which is an amazing price for the value that you get out of it.